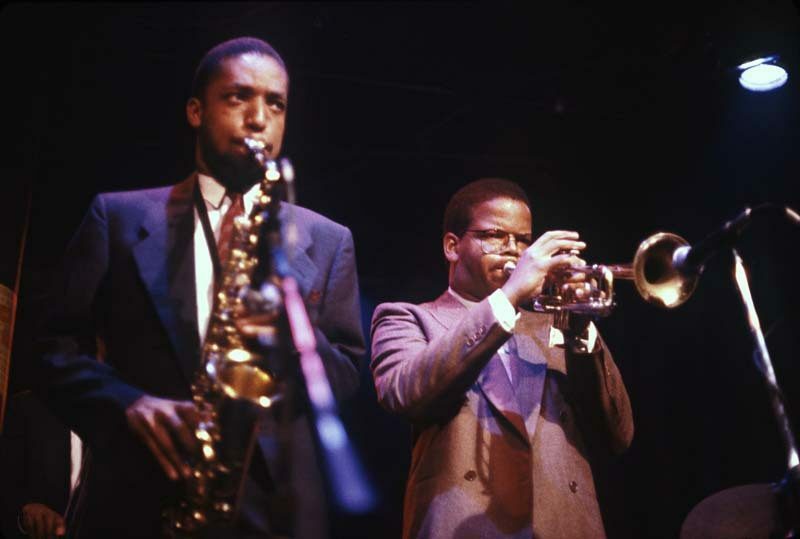 When trumpeter Terence Blanchard replaced Wynton Marsalis in Art Blakey’s Jazz Messengers in 1982, he was just 19. Yet alongside another new member, saxophonist Donald Harrison, he quickly helped shape the Messengers’ sound, contributing tunes that made their way into primary positions on recordings and taking on the group’s musical director responsibilities. More than three decades later, Blanchard’s leadership as a player and composer informs realms beyond his own projects and even jazz in general. Part of that has to do with the humanism with which he approaches his art. He stresses the value of exchanging ideas, and has remained committed to the Blakey ethos of developing younger players. In his own changing lineups, he’s long been known for encouraging all members to write and contribute original music. Blanchard also frequently uses his art to comment on shared human experiences like Hurricane Katrina, which he tackled on his 2007 Blue Note release A Tale of God’s Will, or the police brutality that’s become central to American life, an issue he dealt with on Breathless. His interest in telling the stories of people he believes we can learn from, like Malcolm X, crops up repeatedly in his recordings. In March, he’ll bring his opera about boxer Emile Griffith, Champion: An Opera in Jazz, to the Kennedy Center in Washington, D.C. “Part of what it is that I do artistically is, for those who have gone through [an experience], to have something there that can help them heal and relieve some of that pain,” he said recently, speaking from his home in New Orleans’ Bayou St. John neighborhood. That belief came through as we discussed some of his most memorable recordings-many of which seemed to occupy a special place in his heart as much for the relationships they yielded as for the music itself. This was my first session with Art Blakey. The album is called Oh-By the Way, which happened to be a tune of mine, and we were in Europe and I remember just freaking out that I was in a session with Art Blakey. I remember thinking, “Man, he’s [hired] Freddie Hubbard and Clifford Brown and Lee Morgan and now me,” which is so surreal. He was the type of dude who only did like two takes of every tune. In a weird way, it put a lot of pressure on us but at the same time it was relieving, because after you did the second take, you had to just let it go and go on to the next tune. The entire session went like that. I remember we were up north, I think in Connecticut someplace. Don Elliott was the engineer and George Wein had put us up at this house, and we just stayed there and recorded in these beautiful surroundings. The thing you have to remember about that time, though, is that we were so young. I was still trying to figure out who I was, musically. So I was putting my best face forward during that time because I was being a professional, trying to make sure that I knew the material, seeing what I could add to it artistically. But at the same time I’m still learning about who I am and what it is that I like musically. I was very fortunate that I documented myself at such a young age. … Looking back on it now, it was a very unique and blessed period to be in New York. The experience of having scored [Spike Lee’s Malcolm X] was such a powerful thing that I couldn’t leave it at that. It was such a profound experience, because there was so much going on when the film was made. There was so much controversy around what the movie was going to be, and then they had the whole financial thing about whether Spike was going to be able to finish it. And Spike was getting death threats. I learned later on that there was a lot of stuff going on in terms of people being threatened on the set. All of that played a role in what happened with the Jazz Suite. Wynn Thomas, he was the set designer, I remember him saying to me, “Man, everybody’s giving 110 percent on this film because we loved Malcolm so much and because of the sacrifices he made for humanity.” And that mindset of trying to respect somebody who had such a selfless purpose in life is what motivated us to do that album. 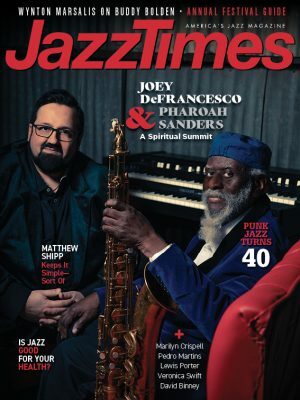 The other thing about doing the Jazz Suite that became very important to me was that I felt back then-and I still feel-that there’s a large segment of the population that doesn’t fully get Malcolm. To me, Malcolm is probably one of the greatest examples of what it means to be a seeker of truth, because when he first became a Muslim he was a staunch advocate for everything that Muhammad espoused. But when he went to Mecca and saw Muslims of all different colors and hues, he didn’t come back and try to brush it under the rug. He didn’t come back and try to manipulate the situation. He came back and said that he made a mistake. He owned up to his mistake and spent the rest of his days atoning for that. To me, that speaks volumes about the honorable nature of who he was as a person. Because think about any politician in your mind who comes close to doing that today, and it’s just a simple thing. We’re all human. To me, that was the important thing about doing the Jazz Suite, to honor that dude. Because I feel like that’s the thing that’s lost, that we don’t have in our leadership in this country. One thing that blew my mind was having Joe Henderson on the session. You just think that a guy like Joe Henderson, he’s gonna come in and just play and then he’s gonna leave. I remember this tune we were working on, and we had a lunch break. And we were going outside to have lunch and somebody said, “Hey, man, did anybody let Joe know that the food’s out here?” ‘Cause he wasn’t outside. And I said, “No, I’ll go get him.” So I walk back into the studio and there’s Joe, with the music at the piano, running through all of the chord changes, practicing. And I went, wow, that’s the sign of a true professional. He’s working at his craft 24/7. It was a beautiful experience, and I think it was Kenny’s last recording before he passed. Just being in the studio with those guys … I don’t know how to explain it, because I don’t want to sound corny, but there’s a certain type of passion and love that those guys not only had for the craft but had for us as individual musicians. It didn’t feel like a session, it felt like a family. McCoy is just an amazing musical presence … and that’s what I kept thinking the entire time I was there. Everything he did I watched, from the way he approached rehearsal to the way he approached doing the session. It was just such an honor to be there. During the rehearsal, in the beginning, he was going to play electric piano. He went to touch it and he said, “Man, this doesn’t have [enough] power,” and I went, “Wow, OK.” I wish a whole slew of younger musicians were here to hear that. But it was just like that the entire time. And every time stuff like that would happen, I would just say “Thank you” to the universe for allowing me to be there to witness it. 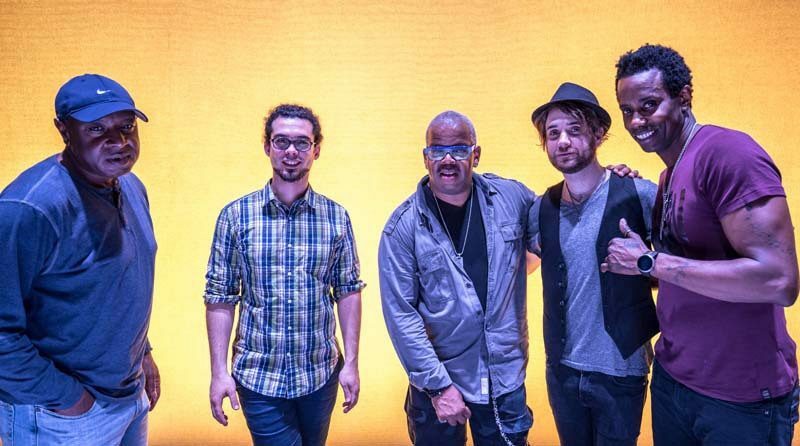 I felt like Bounce was a turning point in my career, because I had put that band together with Harland, and those guys kind of helped me switch gears, so to speak. I was really excited to make that record, because prior to that I had made some of those concept records, like Let’s Get Lost and Jazz in Film, and I wanted to step away from that kind of stuff and just make my artistic statement. We’d already played all the music, so I remember we were just in the studio having fun. That was probably one of the most magical sessions I’ve ever had in my career. We were struggling as a band, because we knew we were trying a lot of different things, putting things together, but we were having fun doing it. We would record the music, and let’s say we were finished for the day maybe around 7. We’d hang at the studio until 2 in the morning, just talking to Herbie and just listening to him. And I remember he said something to us, man, it just clicked, and it changed everybody’s playing and confidence. He said, “Well, who else plays like you guys?” And when he said that, we were like, “Oh, OK.” It was a vote of confidence for what we were doing, but also it let us know that he had already checked us out. And then he made a bunch of comments about us during that session where it really opened us up. He said, “You have your own voice, you have your own sound,” and he said, “Just keep developing that.” And when you have a person like Herbie tell you that, that gives you that vote of confidence because you’re always searching. But when you have somebody of that magnitude who’s just given you validation, it means a great deal. Even to this day, with the new band we have, the E-Collective, he’s come down and checked us out a few times, and he stands on the side and he watches the entire show. It’s still one of those projects I have a hard time taking credit for, because I feel like that emotion in that moment in our history was so powerful that all that music came together. But it would have come together whether it was me or somebody else. All the guys in the band had written something, and then I had taken the themes from the [Spike Lee documentary When the Levees Broke] and rearranged them for jazz band and orchestra, and there were just magical things that were happening. For example, I remember when we wanted to do Kendrick’s tune “Mantra,” we wanted to have a bass intro for it. So when Derrick pulled out his electric bass, Frank Wolf, the engineer, was opening up Pro Tools and he mistakenly opened up a session that we had done for a film. The bass was in the same channel that we had run for the film, and they ran through all of these effects, delays and reverbs, and we were like, “Damn, Derrick how did you get that sound?” And Derrick said, “It’s not me,” and then Frank goes, “Oh, wrong session,” and we were like, “Whoa, we were starting to dig that sound.” So we took that format and then put it into the album. Another thing was I kept thinking about the whole idea of ghosts, and the whole idea of Congo Square, and how this one brother was telling me in the documentary, he said, “Our ancestors have always tried to warn us about what’s coming.” Because if you look at the path the hurricane took, it’s the same path that slave ships used to take. So he said, it’s almost as if our ancestors have been warning us because we never really took care of our brothers. So I said I’d like to do something on Congo Square based on the drums. We started with drums and bass. And as we got out there we started doing the hand claps, and I can’t remember who did it, but somebody started singing, “This is a tale of God’s will,” and everybody picked up on it and that became the title of the album. It was just something that happened in the moment. Breathless was kind of like doing Flow and Bounce in a way, because we had been on the road with the band, playing the music for months. When it came time to do the session, we were like, “Let’s just go in here and have fun doing our thing.” The crazy part was when we did the first take of “Cosmic Warrior,” apparently the power of the song caught everybody off guard. The people in the studio were like, “Oh, my God.” We didn’t realize how big a sound we had gotten. That and some of the stuff with PJ we hadn’t really played on the road, so I remember us being excited by the musical results we got. Then we just started going further. But “Cosmic Warrior” went from being a bass feature to being this powerful rock-and-roll thing.